Some stellar news today! Alcon Entertainment has acquired film and television rights to my ROT & RUIN series! For more details, read the article on Deadline.com! 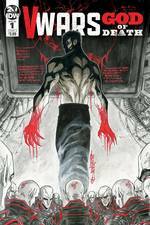 V-WARS: GOD OF DEATH cover reveals! V-Wars news! V-WARS: GOD OF DEATH, a one-shot comic debuts April 24. Art by Alex Milne. Covers by Alex and a variant by Ryan Brown! Read more here! Handing out the Jonathan Maberry Inspiring Teens Award at the Canyon Crest Writers Conference. 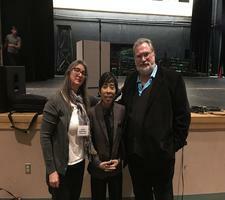 Pictured here with this year's recipient, playwright Aleta Barthell, and previous winner, poet Viet Mai! How's this for some awesome Valentine's Day news? Line Webtoon is launching a "Rot & Ruin" comic! 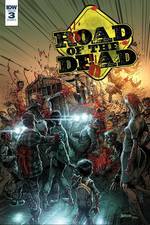 Road of the Dead: Highway to Hell #3 available for purchase! Go here to buy in print or digital. Go here to read more about the series. Cover reveal for RAGE, the first in the new Joe Ledger International series, release date November 5th, 2019. Go here for pre-order links. It's a book birthday! DEEP SILENCE is officially launched! Tomorrow, I'll be having a launch event at Mysterious Galaxy in San Diego, with special guest Ray Porter (who you might recognize as the voice of Joe Ledger)! Join me tonight for another Facebook LIVE AMA (Ask Me Anything) at 11pm EST/8pm PST! Ask Me Anything about my new Joe Ledger book DEEP SILENCE or whatever you'd like. There will be more chances to win some great prizes! DEEP SILENCE goes on sale tomorrow, October 30th. Pre-order your copy here! Join me Tuesday, October 9th at 8:00 pm EST/5:00 PM PST for a Facebook LIVE AMA! 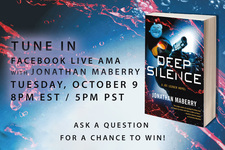 I'll be talking about my new Joe Ledger book DEEP SILENCE and answering your questions, PLUS offering a chance to win some great prizes. DEEP SILENCE is on sale October 30th. Pre-order your copy here! Can't tune in on October 9th? There will be more chances to "Ask Me Anything" in the near future—make sure you "Follow" my updates to receive a notification when LIVE videos start. I'm delighted to discover that GLIMPSE has been nominated for a Dragon Award. You can register here to vote for it, should you feel so inclined. 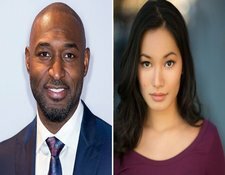 I’m delighted to announce that Adrian Holmes and Jacky Lai have joined Ian Somerhalder in the cast of the the upcoming V-Wars series on Netflix! Read the Hollywood Reporter article here! I can finally break the big news!! 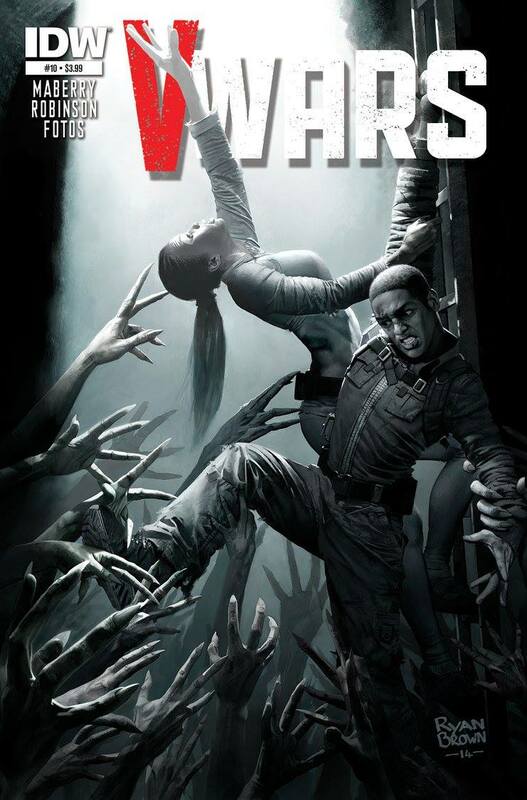 V-WARS wIll be a Netflix series starringIan Somerhalder!!! For more info, go here! Join me tomorrow, February 26th at 2:00 PM EST/11:00 AM PST for a Facebook LIVE AMA! 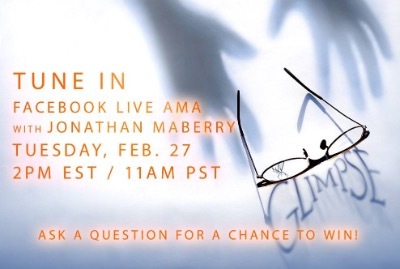 I'll be talking about my new book GLIMPSE and answering your questions, PLUS offering a chance to win some great prizes! Tune in here! 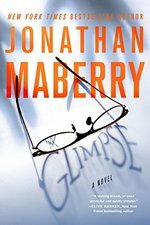 GLIMPSE is on sale March 27. Pre-order your copy now! Can't tune in on February 26th? There will be more chances to "Ask Me Anything" in the near future—make sure you "Follow" my updates to receive a notification when LIVE videos start. Join me next Tuesday, February 13 at 2:00 PM EST/11:00 AM PST for a Facebook LIVE AMA! I'll be talking about my new book GLIMPSE and answering your questions, PLUS offering a chance to win some great prizes. Can't tune in on February 13? There will be more chances to "Ask Me Anything" in the near future—make sure you "Follow" my updates to receive a notification when LIVE videos start. Some book release news for 2018! MARS ONE was named one of the Best Children’s Books of 2017 by Smithsonian Air & Space. See the link here! First, Hardboiled Horror is now available! Hardboiled Horror collects fifteen original tales of noir mystery shot through with elements of horror and the supernatural. Occult detectives, paranormal investigators, seedy P.I.s, amateur sleuths and ghost hunters tackle the cases no one else can handle. Go here for purchase info. Second, there's a Goodreads Giveaway going on to win an advance copy of Glimpse, a chilling thriller that explores what happens when reality and nightmares converge, and how far one will go to protect the innocent when their own brain is a threat. The contest runs from Dec. 4th through Dec. 14th. For more info on how to enter, go here! 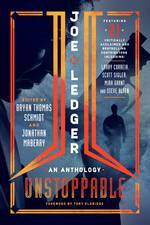 With guest authors from all over, this anthology is a compilation of more than twenty stories that explore the depths of Ledger’s expertise, all the while trying desperately to make sure he survives to face the darkness another day. It even features a story from creator Jonathan Maberry, just to keep us course corrected. Other authors include Larry Correia, Mira Grant, Scott Sigler, David Farland, Christopher Golden, Tim Lebbon, Steve Alten (a favorite of mine), Jon McGoran, Dana Fredsti, Joe McKinney, Jennifer Campbell-Hicks, Javier Grillo-Marxuach, Bryan Thomas Schmidt, GP Charles, Keith DeCandido, James A. Moore, Weston Ochse, Aaron Rosenberg, Nicholas Steven, James Ray Tuck, and Jeremy Robinson. Book news! 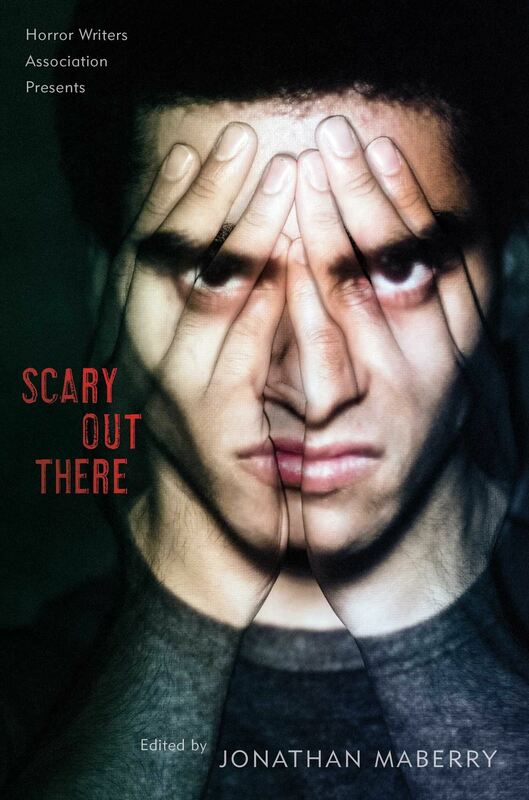 The paperback edition of SCARY OUT THERE debuted this week, just in time for Halloween! SCARY OUT THERE is an anthology of all-new horror stories by today’s top writers, edited by 5-time Bram Stoker Award winner Jonathan Maberry. SCARY OUT THERE features stories and poems by Brenna Yovanoff, Carrie Ryan, Cherie Priest, Christopher Golden, Ellen Hopkins, Zac Brewer, Ilsa J. Bick, Josh Malerman, Kendare Blake, Madeleine Roux, Nancy Holder, Neal Shusterman, R.L. Stine, Rachel Caine, Rachel Tafoya, Steve Rasnic Tem, and Time Waggoner; with poetry by Linda Addison, Jade Shames, Lucy Snyder and Marge Simon. From Simon & Schuster Books for Young Readers! Broken Lands: A Novel of the Rot & Ruin, will be published October 2nd, 2018 by Simon & Schuster Books for Young Readers. 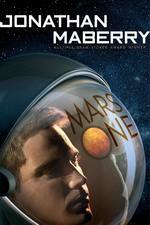 Pitchstone Publishing has bought the audio rights for Mars One! Just a reminder that my ComicCon schedule is here. Hope to see many of you there! I'll be a guest on COAST TO COAST AM for NIGHTS OF THE LIVING DEAD. I'll be on from 11pm-2am (PST) on July 11th, the anthology's release date! My ComicCon 2017 schedule is coming together! There will no doubt be additions and changes, so make sure to check out the page here as ComicCon approaches. 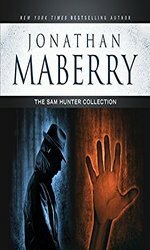 My collection of noir mystery-horror stories featuring werewolf private eye Sam Hunter is today's AUDIBLE DAILY DEAL. Read by the amazing and award-winning Ray Porter. These five short stories are fan favorites. Grab your copy right now! Sale ends midnight tonight. 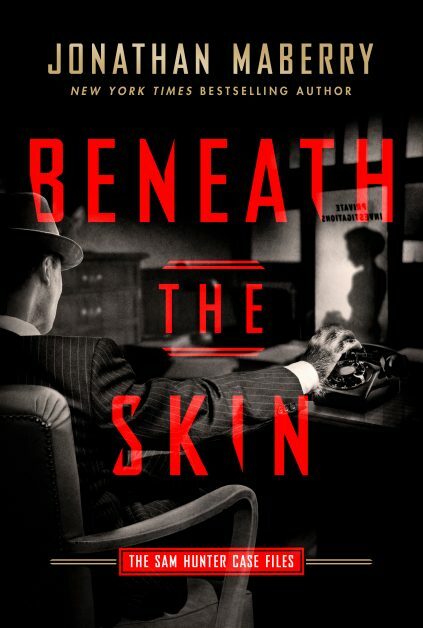 Audible daily deal: BENEATH THE SKIN: The Sam Hunter Case Files by Jonathan Maberry; read by Ray Porter. $1.95! This has been a book-release heavy year so far and things aren't slowing down anytime soon. 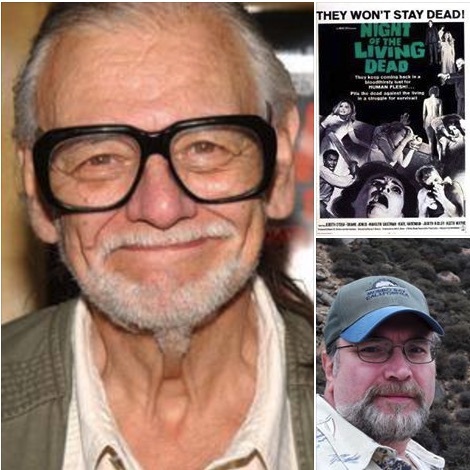 The anthology Nights of the Living Dead, co-edited with George Romero and featuring a truly kickass lineup of authors, is being released on July 11th and there are already two book events lined up in Southern California to celebrate the launch. The first will be at Dark Delicacies in Burbank on Saturday, July 15th starting at 4pm. I'll be joined by John Skipp and hopefully other contributing authors (TBA). The second will be at Mysterious Galaxy in San Diego on Sunday, July 16th starting at 3pm. This is a joint event with Dana Fredsti for the release of her latest novel, Spawn of Lilith. We're having a special giveaway for people who purchase both books. There will be other contributing authors (TBA) for Nights of the Living Dead joining us as well, along with refreshments. Come join the fun at both events! #BookNews!! David Gale at Simon & Schuster has bought Jonathan Maberry's ROT & RUIN: BROKEN LANDS, which will push reset on his YA series ROT & RUIN, about teenagers surviving the zombie apocalypse. In Broken Lands and its sequel, Lost Roads, Maberry introduces a new cast of characters and puts a new spin on the walking dead by exploring bizarre mutations, new human threats, and a nightmare landscape of nature gone wild and weird. The books are scheduled for summer 2018 and 2019; Sara Crowe at Pippin Properties did the deal for world rights. For those who missed the newsletter (and if you're not signed up for my newsletter, visit the Contact page here and sign up for all the latest news and special events), The X-Files Origins: Devil's Advocate has been released along with The X-Files Origins: Agents of Chaos by Kami Garcia! 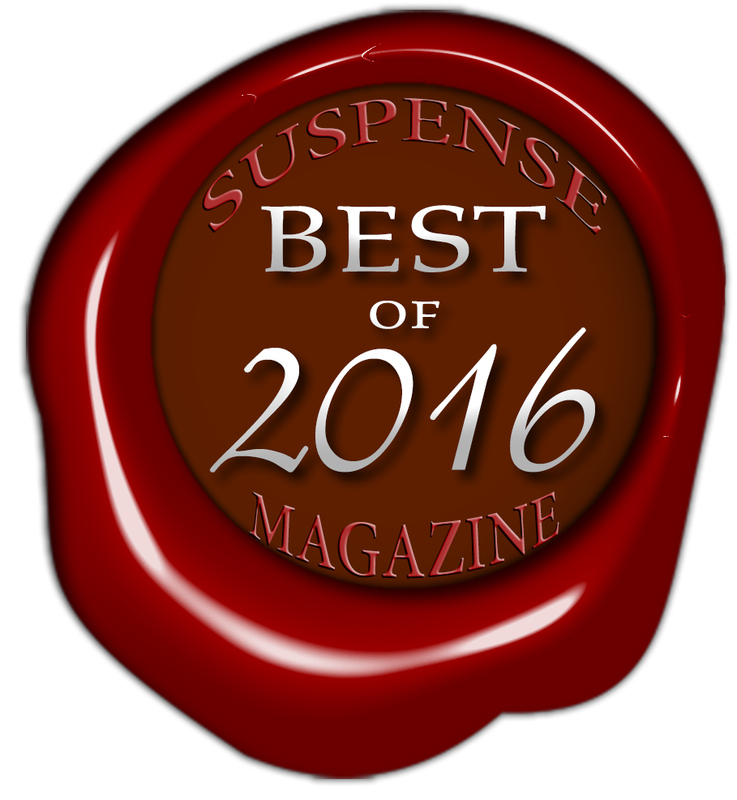 Kill Switch has been selected as one of Suspense Magazine’s “Best of 2016” books in the Dark Urban Fantasy / Paranormal category! Book Release! BENEATH THE SKIN: The Sam Hunter Case Files. Noir private investigator stories with a bite. Check it out here! Awesome news - I've been asked to be a Special Guest at ComicCon 2017! So if you're attending next year, look for me there! More news as it comes in. 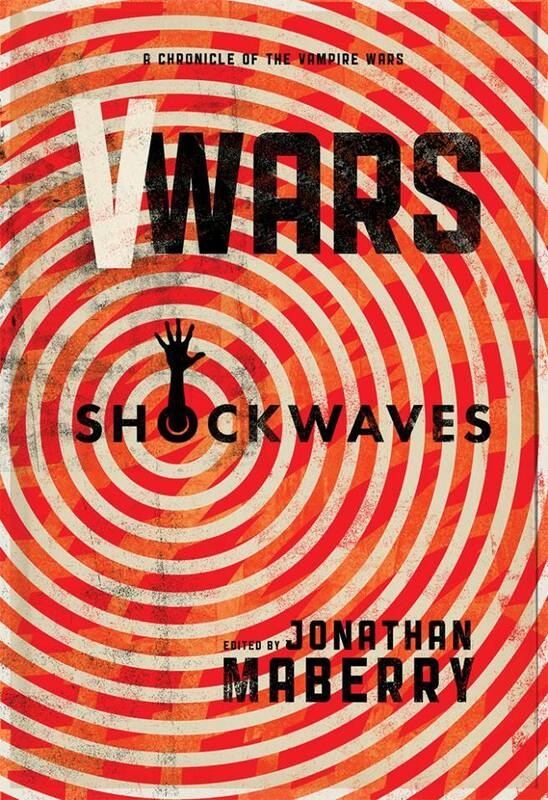 V-Wars: Shockwaves! NEW RELEASE: The final volume of the V-Wars quadrology debuts today! All new stories by Joe McKinney, Dana Fredsti, Jade Shames, James Ray Tuck Jr, Lucas Mangum, Jeff Mariotte & Marsheila Mariotte, Nancy Holder, Jennifer Brozek, Lois Gresh, John Skipp & Cody Goodfellow, Mike Watt, John Dixon, Weston Ochse, and Yvonne Navarro. Go here for info on where to buy! Gearing up for the Scary Out There blog tour starting on August 22nd. For the complete schedule, go here! Check out the interview I did on writing Dark of Night! Thanks to David Dunwoody for the opportunity to be first in his new Nano-Interview series, which "plugs into the brains of talented zombie artists and extracts their wit, wisdom and anything else it can get its teeth into." Read the interview here. 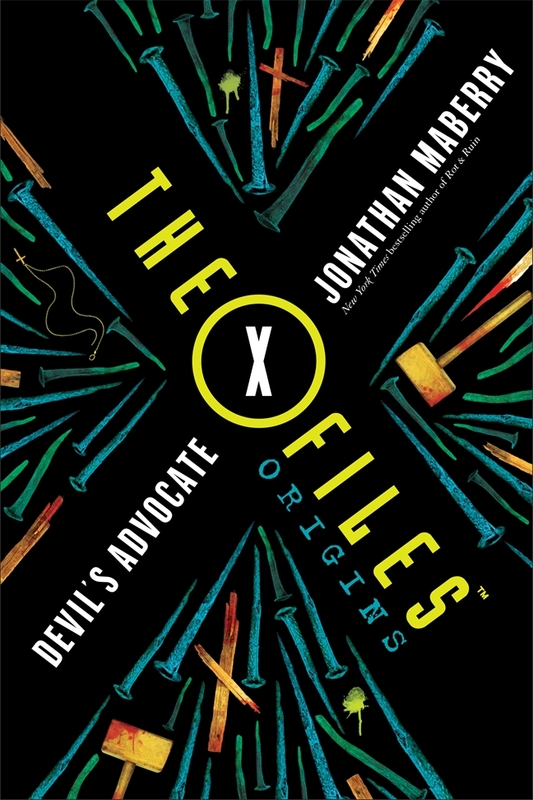 ‪#‎XFiles‬ Origins: DEVIL'S ADVOCATE now available for pre-order!! 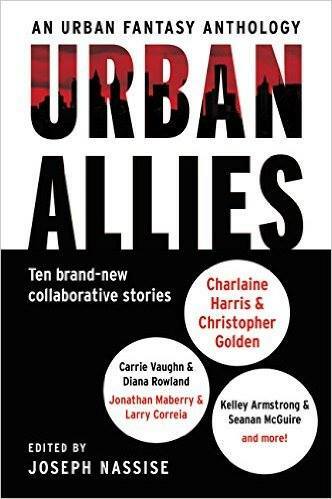 Joe Ledger meets Agents Franks in a shared adventure by me and Larry Correia in URBAN ALLIES. Out now! Sherlock Holmes is one of the most iconic and lasting figures in literature. His feats of detection are legendary, and he continues to capture audiences today. 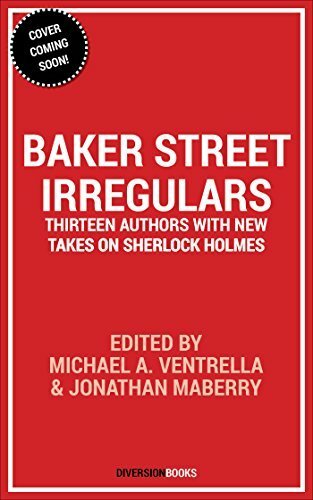 But BAKER STREET IRREGULARS presents the celebrated detective in a dozen different, wildly entertaining new ways. In Ryk Spoor's thrilling "The Adventures of a Reluctant Detective", Sherlock is a re-creation in a holodeck. In Hildy Silverman's mesmerizing "A Scandal in the Bloodline", Sherlock is a vampire. Heidi McLaughlin sends Sherlock back to college, while Beth Patterson, in the charming "Code Cracker", turns him into a parrot. The settings are as varied as Russia in the near-future, a dystopian world, a reality show, an orchestra. Without losing the very qualities that make Sherlock so illustrious a character, these authors spin new webs of mystery around their own singular riff on one of literature's truly singular characters. Kill Switch fans...there's a new Harry Bolt/Violin/Sam Hunter story in LIMBUS INC Vol III (out tomorrow) that connects to the latest Joe Ledger novel. Check it out! 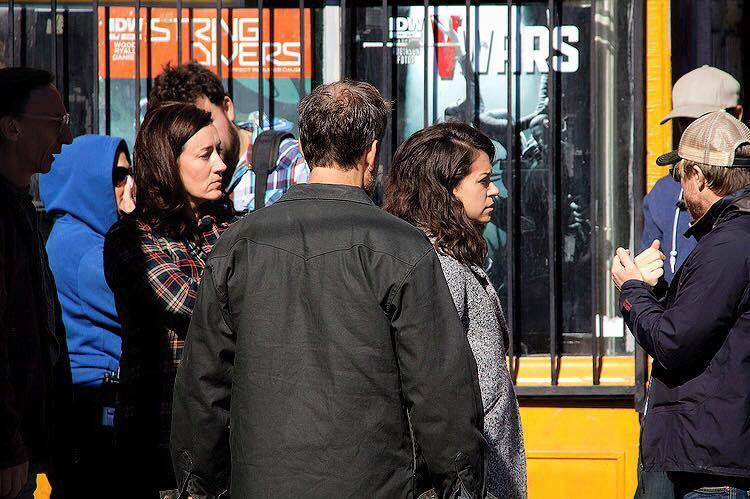 Interview on ‪#‎XFilesOrigins‬ on XFilesNews ‪#‎TheXFiles‬: click here! Lots of news today! 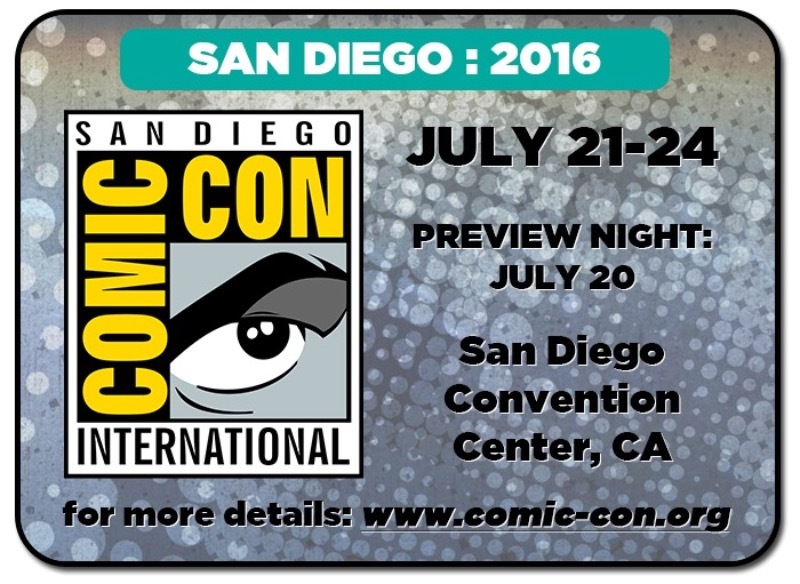 Also, updated ComicCon Schedule here! ‪#‎MovieNews‬ from ‪#‎SDCC2016‬ -my upcoming teen sic-fi novel, MARS ONE, has been optioned for TV by producers Janet Zucker (Zucker Productions) and Tony Eldridge (Lone Tree Entertainment). The novel debuts 4/4/2017. Look for more info on that on my website in the next few days! Check out this interview with me and Kami Garcia with Entertainment Weekly. We reveal new details about X-Files: Origins! My first collection of short fiction is now available! 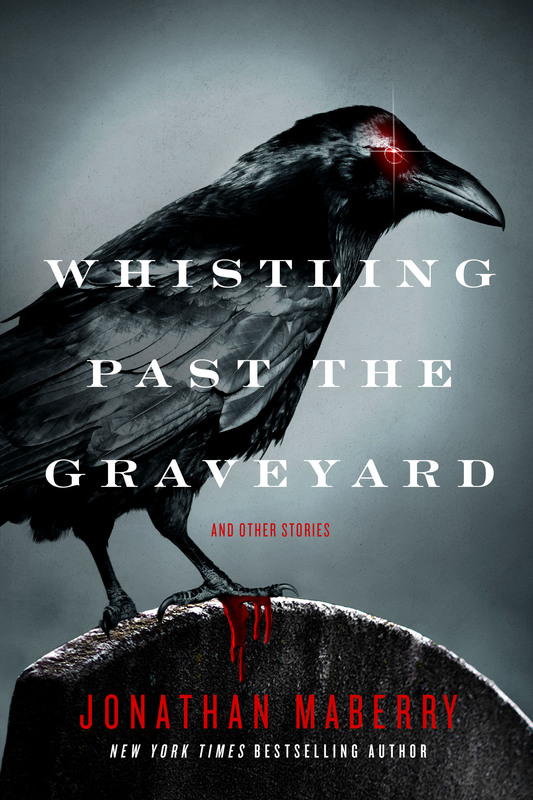 Whistling Past the Graveyard now available in paperback and hardback! Order Here! Just in time before ComicCon! 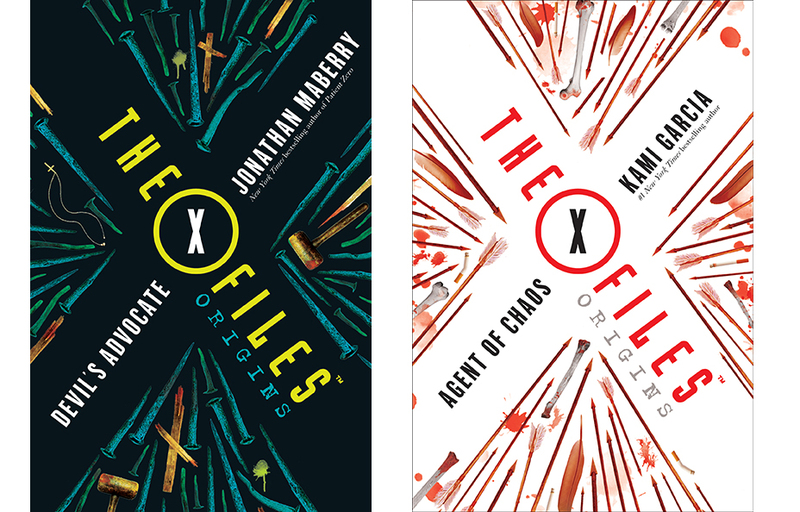 The reveal of the covers for the X-Files Origins books: Agents of Chaos, featuring a 17 year old Mulder and Devil's Advocate, featuring a 15 year old Scully. Check out the Wall Street Journal article here! It's once again time for ComicCon, folks! My schedule is posted here, with possible additions still to come! eBook version of Whistling Past the Graveyard available for purchase today! The hardcover and paperback versions will be available on July 22nd, just twelve more days! Go here for the eBook! Welcome back to Pine Deep with the special 10th anniversary edition of Ghost Road Blues, available now! Dead Man's Song 10th anniversary edition will be out on August 30th; and Bad Moon Rising will be released December 27th. What makes a good day great? Finding out Dark of Night is currently #6 on Amazon's AudioBook Bestseller list for Horror! New release of Out of Tune: Book II. 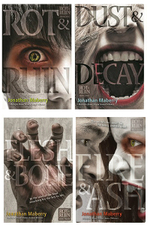 "New York Times bestselling author Jonathan Maberry presents a brand new collection of original stories by some of today’s top authors of horror, dark fantasy, and science fiction. Each tale draws strange inspiration from classic folks songs and murder ballads from around the world. 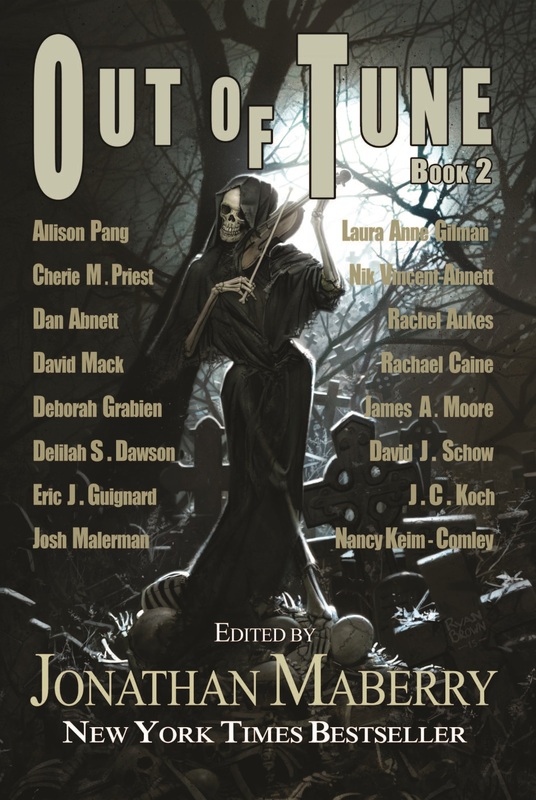 OUT OF TUNE Volume 2 includes strange and disturbing stories by Rachel Caine, Cherie Priest, David Mack, Dan Abnett, Laura Anne Gilman, Delilah Dawson, Alison Pang, David J. Schow, James A. Moore, Nik Vincent-Abnett, J.C. Koch and Eric J. Guignard." Check out the Anthologies page for more info! ‪#‎BreakingNews‬ I'm editing ALIENS: BUG HUNT, all new stories of the Colonial Marines (Titan Books, 2017) Here's the killer lineup! 2. Christopher Golden, #1 New York Times best-selling author, editor and comic book writer. His works include Tin Men, Lord Baltimore (with Mike Mignola), Cemetery Girl (with Charlaine Harris), and Aliens: River of Pain. 3. Dan Abnett is a multiple New York Times best-selling author and comic book writer who's work includes the Gaunt's Ghosts series, The Horus Heresy, Doctor Who, and the Guardians of the Galaxy comic that inspired the motion picture. 16. Tim Lebbon, is the best-selling author of Coldbrook, The Cabin in the Woods, the Noreela series of fantasy books (Dusk, Dawn, Fallen and The Island), the NY Times Bestselling novelisation of the movie 30 Days of Night, Alien: Out of the Shadows, and Star Wars: Dawn of the Jedi - Into the Void. 18. Yvonne Navarro, Bram Stoker award-winning author of the Dark Redemption Series, Aliens: Music of the Spears, and seven Buffy the Vampire Slayer novels. May 11, 2016: And because Church gets representation in CafePress, so do I! Just added Rot & Ruin Zombie Trading Card merch featuring yours truly. Zombies were people too! May 10, 2016: Finally, Mr. Church gets representation in my CafePress store. Why? Because he has friends in the industry. Check it out here! Looking for some fun gift ideas for your favorite Joe Ledger or Benny Imura fan? Check out the gear here at my CafePress store. Make sure to check back for new designs in the next couple of weeks. April 21, 2016. Talk about an awesome surprise! On tonight's episode of Orphan Black, the clones are hiding out in the basement of a comic book store and one of them asks if they have the latest issue of the "ROT & RUIN" comic. How cool is that? And ... check out the poster of my V-Wars comic in the window! Here's the full cover art by Ryan Brown. This is one of the proudest days in my life as a writer and writing teacher. The books in the photo are actually two sides of a 'Double Down', two novellas in one, published by JournalStone. On one side is DARK OF NIGHT, a novella I wrote with former writing student Rachael Lavin (known online as Rachael Elle). 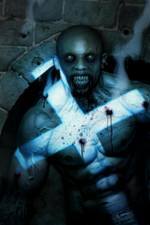 It combines the Joe Ledger series with DEAD OF NIGHT and the ROT & RUIN. 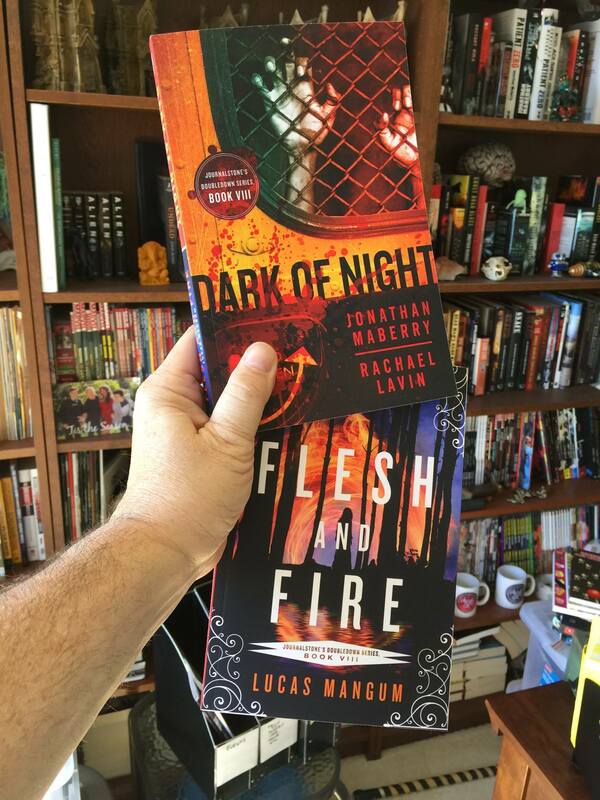 On the flip-side is FLESH AND FIRE, a novella written by another former writing student, Lucas Mangum. This is a debut for both of them, and I can guarantee that these are writers who are going to make a serious impact on the world of horror and dark fantasy. Congratulations to them both! The book debuts in print and eBook on Tuesday 4/22 and on audio in May (read by Ray Porter). Calling AL L zombie fans! 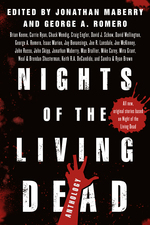 New York Times bestselling author Jonathan Maberry (Patient Zero, Rot & Ruin) and the godfather of the dead himself, George Romero (Night of the Living Dead) are joining forces to edit Nights of the Living Dead, an anthology of all-original stories set in the 48 hours surrounding Romero’s landmark film. If you love zombies –and who doesn’t?—it all started with NOTLD. Every zombie movie, comic, book, game, or toy exists because of Romero’s landmark film. Brad Thor, #1 New York Times bestselling author. Chuck Wendig, New York Times bestselling author of Star Wars: Aftermath. David Wellington, bestselling author of the landmark Monster Island and its sequels as well as the critically acclaimed new zombie novel, Positive. George Romero, the Godfather of the dead. Isaac Marion, author of the #5 New York Times bestselling zombie novel, Warm Bodies, which was made into a successful movie. Jay Bonansinga, New York Times bestselling author of the Walking Dead novels. Joe R. Lansdale, bestselling & Bram Stoker Award-winning author of 45 novels as well as comics and short stories. His mystery series Hap & Leonard is in production for TV. His Bram Stoker Award-winning short story, "On the Far Side of the Cadillac Desert with Dead Folks," was included in the first-ever zombie anthology, Book of the Dead (edited by John Skipp and Craig Spector). Joe McKinney, multiple Bram Stoker Award-winning author of zombie fiction Dead City, The Savage Dead, and others. John Russo, co-screenwriter of Night of the Living Dead, and author of the first-ever zombie novels Night of the Living Dead and Return of the Living Dead. 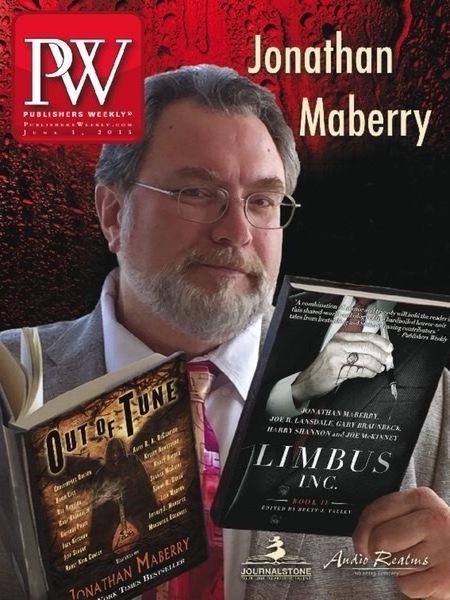 Jonathan Maberry, New York Times bestselling author of Patient Zero, Rot & Ruin, Dead of Night, Zombie CSU, and co-author of Marvel Zombies Return. Keith R.A. DeCandido, bestselling author of the Resident Evil novelizations, as well as popular novels in the worlds of Buffy the Vampire Slayer, Star Trek, Sleepy Hollow, V-Wars, etc. Mike Carey, award-winning comic book writer (Lucifer, soon to be a TV series, Hellblazer, X-Men: Legacy) and novelist (the Felix Castor series, The Girl with All the Gifts, which is in post-production for film). Mira Grant, New York Times bestselling author (pen name of Seanan McGuire) whose Newsflesh series hits every zombie best-of list and was ranked #74 in an National Public Radio listener poll of the top 100 thriller novels of all time. Mira/Seanan has won the John W. Campbell Award, Darrell Awards Hall of Fame, six Pegasus Awrds, and a Hugo Award. 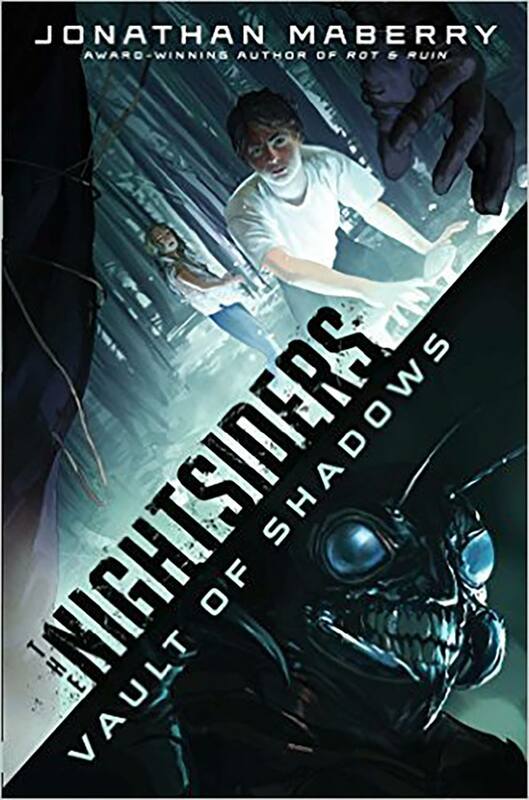 Neal Shusterman & Brandon Shusterman. 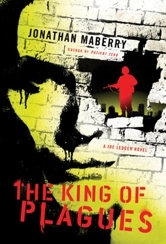 Neal is a winner of the National Book Award and a bestselling author. His son, filmmaker Brandon, is a frequent collaborator on Neal’s short fiction. Sandra Brown & Ryan Brown. Sandra is an international bestselling author of over 70 novels; Ryan is the celebrated author of the zombie sports novel Play Dead. I’m insanely honored to be the recipient of an award that is named after me. Yeah...I know. That’s surreal. 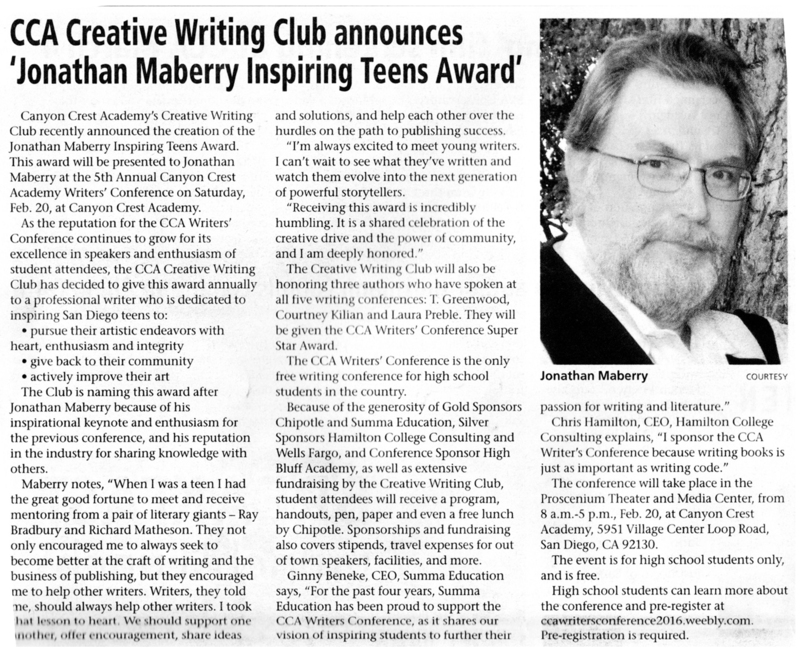 The CCA Writers Conference –the nation’s only absolutely free writers conference for teens—has created the Jonathan Maberry Inspiring Teens Award.